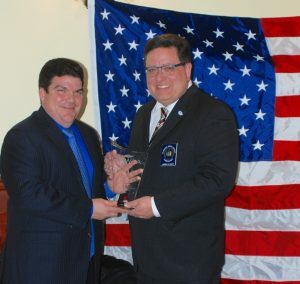 Williston Park NY, USA……………………….The Nassau Suffolk Water Commissioners’ Association (NSWCA) honored outgoing President Andrew N. Bader at a meeting sponsored by Albertson Water District Commissioners Richard Ockovic, Howard Abbondondelo, and Ken Vey. During said tenure Mr. Bader was responsible for directing the organization’s conservation and sustainability outreach and was instrumental in formulating the NSWCA’s position on 1,4 dioxane. In addition, Mr. Bader presided at the NSWCA Educational Series that featured the Irrigation Association of New York, Dr. Harold Walker, Professor and Chair of Civil Engineering at Stony Brook University and Co-Director of the New York State Center for Clean Water Technology, and Deputy Commissioner of Public Safety, Town Of Oyster Bay (NY) Leonard Symons on hurricane preparedness. President Bader, who also provided closing remarks at the 2017 LIWC Legislative breakfast, will continue to be active in the NSWCA.